Both George and the Russian Byzantinist Alexander Vasilieff (who accompanied him at the beginning of his Tahitian visit) greatly admired Le Mariage de Loti, the autobiographical novel by Julien Viaud published in 1880. One of the most atmospheric passages in the novel describes the heroine, the fourteen-year-old Tahitian Rarahu, emerging from the scented shade of mimosas to bathe in a pool fed by the 900-foot Fautaua waterfall. Within days of arriving, George and Alexander wanted to visit this pool, which is generally known today as ‘Bain Loti’ (its depth varies greatly, depending on rainfall in the central mountain area of Tahiti). However, in Tahiti George devotes only four lines of the chapter to the eventual visit. Characteristically, the rest of the chapter describes in great detail how the charming but wild Tahiri-i-te-rai leads them to a ‘rather muddy pool between two brown, sloping banks; even the waterfall had disappeared. A few yards away a sort of stone kiosk and a wooden trap-door in a patch of weeds, fenced round with a [sic] barbed wire, marked the head of the Papeete waterwork system’. ‘How it has changed!’ the foreigners exclaim. There could hardly be a more telling contrast than ‘barbed wire’ and the ‘sylvan paradise which we remembered in Le Mariage de Loti‘. Tahiri had led them to a place which, she explained, was called in Tahitian ‘Spotted Hog’. This was her idea of a joke, and George did not realise he had been deceived until much later. The monument to Pierre Loti (Julien Viaud) was recently reopened at ‘Bain Loti’ on Tahiti and here is a link to that event. 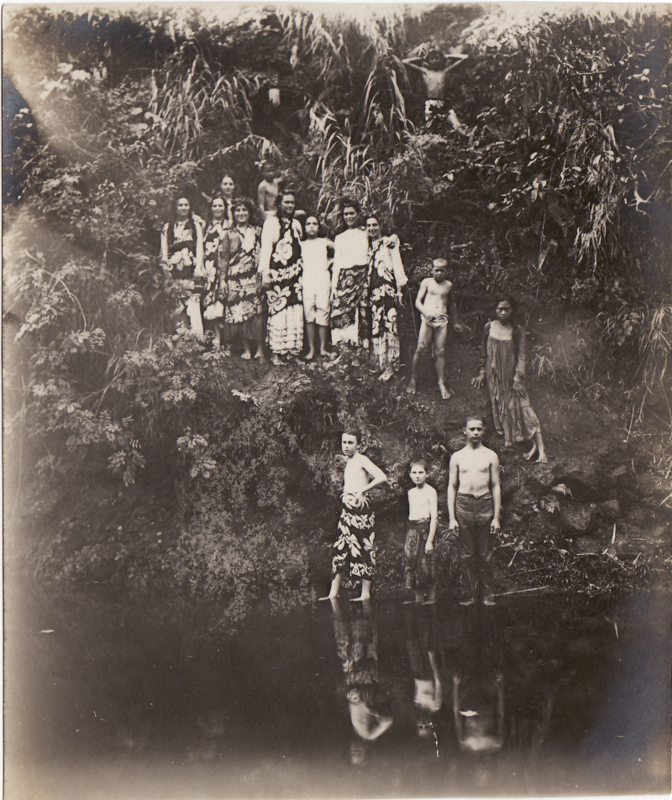 This entry was posted in George Calderon, Timeline and tagged Alexander Vasilieff, Fautaua waterfall, George Calderon, Julien Viaud, Le Mariage de Loti, Papeete, Pierre Loti, Rarahu, Spotted Hog, Tahiri-i-te-rai, Tahiti. Bookmark the permalink.